Various companies often have various dashboards to let them know about what’s going on within the company. 37signals, a software company that makes products like Basecamp, has a backend/dashboard that they call Queen Bee. While I’m not a huge fan of the name, I like what they use it for and how they are tying it into their company. 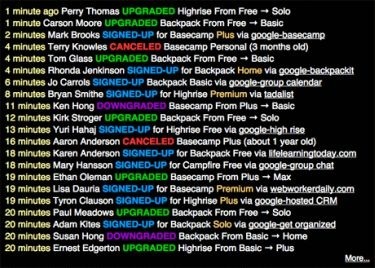 Who is signing up, upgrading, downgrading, and canceling (and for what plan). From which plan to which plan someone is going when they upgrade. When someone cancels, how long they were a customer. When someone signs up, where they came from. When and who did whatever action is mentioned. I am a bit of data / dashboard nerd myself. I think they’re really valuable and it is important to keep an eye on what is going on at all levels. The color coding and general simplicity of it makes it simple for everyone to understand. It is definitely easy to glance at and it is definitely easy to quickly comprehend (as well designed dashboards should be). While the actual value of something like this just for real time knowledge’s sake is something you can argue (I’m not sure how valuable it is personally), I would be interested to see what 37signals does with the data. If a one year customer cancels, do they email the customer and see what the problem is? Do they trend the data to see what their customers are doing and how that may tie into their product? I would also be interested to see what they do with the data since they have it real time. 37signals lets all their employees have access to this system. The company is small (in terms of employees) and their organizational structure does not look like a typical company’s organizational structure, but the idea of keeping employees in the loop about what is going on at the company is good. What sort of backend systems do you use to keep track of things? Tell us about them and how you use them to your advantage. « Help outside of the help section.